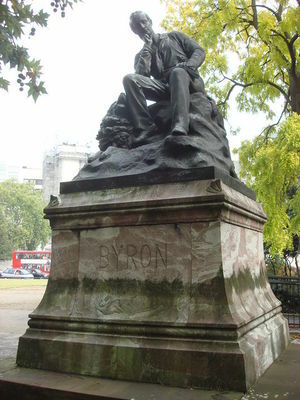 Byron Statue, Hyde Park, London, by Richard C. Belt, 1881. Achilles by Richard Westmacott at Hyde Park Corner, London, 1822. Sir Edwin Landseer, Lion, Nelson's Column in Trafalgar Square, London, 1867. The statue of Horatio Nelson by Edward Hodges Baily, 1843, Trafalgar Square, London. Statue of Eros (Anteros) by Sir Alfred Gilbert, 1893. Victoria Memorial by Thomas Brock, unveiled on 16 May 1911. John Stuart Mill statue by Thomas Woolner, 1878, Temple Gardens, London. The Art of Sculpture in Victorian Britain. Bob Speel's Website - A Selection of Iconic Sculpture in London. Comedy and Tragedy by Sir Alfred Gilbert, ca. 1890–2, Tate. Statue of Queen Victoria in the Great Hall, Winchester Castle by Sir Alfred Gilbert, 1887. This page was last modified on 27 June 2016, at 10:51.